It may be hard to believe, but spring break is coming up in just over a month! You might be wondering what kinds of activities to plan for your kids while they are off school. 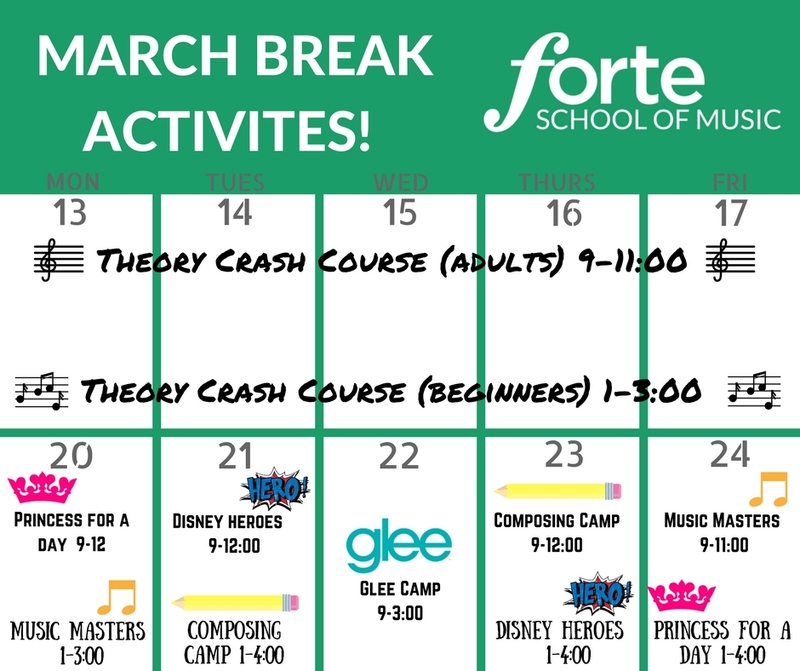 At Forte School of Music in Duncan, we are offering a wonderful variety of spring break music camps this March! Full day, half day, and 2-hour camps are available for a variety of ages. Check out our calendar of spring break music camps, as well as a full description of each camp below. Description: This beginner theory camp, structured specifically for adults, is perfect for those who haven’t taken music theory before. We will follow the RCM Prep Level syllabus, ideal for those who are taking Prep level in their instrument or who are new to music theory. Some ability to read notes on a musical staff is ideal. Description: This beginner theory camp is perfect for children who haven’t taken music theory before. We will follow the RCM Prep Level syllabus, designed for students who are taking Prep level in their instrument (ex: Piano Prep A/B or Voice Prep). It’s also great for students who are at a higher level in their instrument but who have not taken theory before. Some ability to read notes on a musical staff is ideal. Description: Let your little one find their inner princess at Forte’s Disney Princess themed, half day camp. Children ages 5-8 will sing enchanting princess songs, play royal music games, as well as have fun creating a beautiful souvenir to take home! Description: This 2-hour camp is a wonderful opportunity for your little one to learn about music masters of the past, with exposure to great composers. We will make instruments with everyday items and create a music masterpiece all their own. This introduction course is suitable for children with no musical experience, just a desire to have fun and become a music master. Description: Let music unleash your hero powers at Forte’s Disney Heroes, half day camp. The little heroes that attend this camp will sing exciting Disney songs, test out their powers during some music games, and create a special super hero craft to take home! Description: Bring out your child’s inner composer in this half day music camp. Camp composers will learn about famous music composers, craft their very own instruments to play, write songs in a variety of styles, and perform a final song they write together as a group. Description: Forte’s Glee Camp is a jam packed day filled with music and confidence building activities structured for more advanced performers. During this full day camp, as a group, singers will learn and polish 1 song including harmonies and choreography. Throughout the day students will also get the opportunity to work in smaller vocal groups, learning how to create their own mash-up or harmonies! This entry was posted in Camps, Choir, Singing, Spring Break Camps, Theory. Bookmark the permalink.